In 2000, The Eyeliners set your ears on fire with “Here Comes Trouble”. This year, The Eyeliners up the ante with their upcoming release, “Sealed With A Kiss” – 12 unstoppable pop punk gems that are sure to set your heart on fire! So sit back and enjoy the ride. 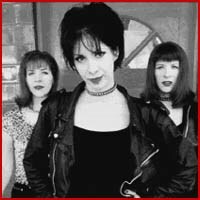 The Eyeliners formed several years ago when three sisters from Albuquerque, NM wanted to start a band. Gel and Lisa took on the responsibilities of guitar and bass respectively and Laura was going to be the singer. Since they never set out to form an all-girl band, The Eyeliners auditioned both male and female drummers, but couldn’t find anyone who understood the direction they wanted to go in. They began to wonder if this band would ever become a reality. That’s when fate stepped in. Gel had borrowed a drum set from a friend that they were using for the drummer auditions. One day, Gel and Lisa were rocking out to “I Love Rock N Roll” when Laura walked in. They persuaded Laura to try the simple drumbeat on the borrowed drum set. Although she had never played drums before, she picked up the drumbeat remarkably fast. About halfway through the rendition of the song, she started to sing along. It was then that Laura took on the task of lead vocalist and drummer and what was to become the Eyeliners was soon underway. The band played their first show at a party 2 months later under the name of Psychodrama – a name they hastily picked out the day of the show. They soon began playing several shows and recorded and released a DIY 7″ called Vivid on their own label, PKR (Peachy Keen Records). Enthusiastic and determined, they began booking their own tours, and upon touring the west coast, they decided to change their name to something much more appropriate and unique – The Eyeliners. A few months later, fate stepped in again when The Eyeliners played a show with the Red Aunts. Red Aunts frontwoman, Terri Wahl, was so impressed with the band that she introduced them to Long Gone John, owner of Sympathy For the Record Industry. Long Gone John loved what he heard and The Eyeliners debut CD and 7″ was in the works. Two more seven inches (“Do The Zombie” and “Rock N Roll, Baby”) followed on Sympathy for the Record Industry over the next couple of years. In 1999, The Eyeliners caught the attention of Ben Weasel and he was eager to release their newly recorded album “Here Comes Trouble” on his label Panic Button Records, to be co-released with Lookout! Records. “Here Comes Trouble,” which was recorded with Mass Giorgini (Screeching Weasel, The Queers, Groovie Ghoulies etc. ), was released in March 2000 to rave reviews. Building steam, the Eyeliners then joined up with the Mr. T Experience and American Steal on the Lookout! Freakout Tour in September 2000 and followed that up with 2 sold out shows with Screeching Weasel at the House of Blues in Chicago. Upon returning from tour, they began writing the songs that would soon make up “Sealed With A Kiss”. It was during this time that they truly began to sharpen their sound, blending well-crafted pop punk songs about love and heartbreak with 50’s rock n roll style and attitude. “Sealed with a Kiss,” was recorded and produced by Ryan Greene (NOFX, Lagwagon, Me First and the Gimme Gimmes, No Use For A Name, Lunachicks, etc. With it The Eyeliners take their song writing to a new level musically while maintaining their trademark style and attitude that they are known and loved for. Among the twelve tracks are the title track “Sealed With A Kiss”, which is a fast paced love song that will stick in your head for days, “Play It Again”, a song whose lyrics are comprised of song titles of memorable punk songs throughout the years, and “It Could Have Been You” (featuring Ben Weasel on guest vocals), a love song about two people who cross paths but never actually meet. Having played over 250 shows with such bands as Screeching Weasel, Fugazi, L7, The Queers, The Mr. T Experience, Red Aunts, Groovie Ghoulies, The Specials, The Avengers, Vice Squad, Flogging Molly, Southern Culture on the Skids, Dillinger 4 and Man Or Astroman, The Eyeliners have earned the respect of reviewers, press, and fans alike as an energetic and unpredictable live band that is not to be missed. This year they will be playing on a leg of the Warped Tour as well as the Plea for Peace tour over the entire US and Canada, so catch them in a city near you!